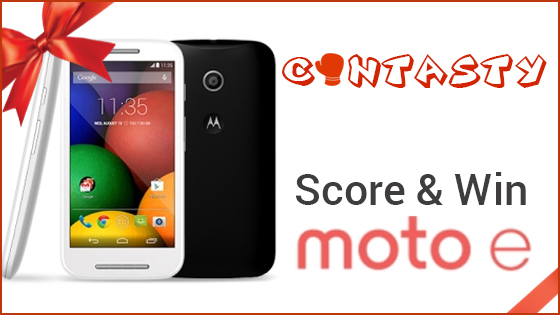 Contasty: Win Moto E for FREE By Earning Coins NOW! Don’t lose a chance to win brand new “Moto E” smartphone NOW! You just need to earn maximum coins in Contasty to get it for FREE. All you need is to play and have fun. Yes, play! So, read the rules of the game and grab your prize! We know that you are intelligent and you won’t miss such an easy opportunity to win your Moto E! So, go get it! It is waiting for you! Be the highest scorer and get crowned at Contasty! The result will be announced on the last day itself i.e. Friday July 31, 2015. Ojas Softech Pvt. Ltd. owns the right to cancel or amend this competition at any moment without notice. Any dispute regarding the rules of competition will be settled by the Ojas Softech Pvt. Ltd. and it shall be final as well as unchallengeable. No further correspondence shall be entertained regarding the decision taken and reason given for that by Ojas Softech Pvt. Ltd..
By entering the competition, you hereby warrant that all the information given by you is correct. Incorrect information will make you ineligible for the contest. Ojas Softech Pvt. Ltd. holds the right to verify your given information anytime. The competition is only open to the people who are Indian residents. People who are the residents from outside India may not apply. People of any age group are eligible to participate in this competition. Participants under the age of 18 must have consent from their parent/guardian about participating in this competition. The winner will have to provide us with an ID proof. If the winner is under 18, parent/guardian consent proof is also required. Ojas Softech Pvt. Ltd. reserves the right in its absolute discretion to disqualify any participant on reasonable grounds or if any rule is breached. Ojas Softech Private Limited employees are not eligible to participate in this competition. If a prize-winner gets disqualified, Ojas Softech Pvt. Ltd. holds the right to choose an alternative participant as the winner. Ojas Softech Pvt. Ltd. accepts no responsibility for deleting any entry. Any misconduct of a participant will disqualify his/her entry and it will be the sole discretion of Ojas Softech Pvt. Ltd.
Prizes are non-transferable and there is no cash alternative. In case of the non-availability of the offered prize, Ojas Softech Pvt. Ltd. reserves the right to offer a prize for equal or greater value at any time. In case the prize is not received by the winner and it gets returned in 20 days, Ojas Softech Pvt. Ltd. holds the right to transfer the prize to an alternative winner. Ojas Softech Pvt. Ltd. holds no responsibility to any emotional or physical loss caused by participating in this competition, including as a result of any entrant winning or not winning prize. You agree that Ojas Softech Pvt. Ltd. can use your entry for any promotional purpose, like putting it on the website.